Louise Schiele was in Ireland on vacation and ran into this musician, with sheep and kids running around. Thus, Man With Squeezebox Art Quilt was born from a photo she took! Vacationing in Ireland several years ago, I was fortunate to have come upon this setting of a man playing music along the roadside while his children and several small lambs where playing and dancing. From one of those photos, I worked up this fiber collage piece. The area was very rural and colorful, the perfect setting for such a piece. Images show the front, close-ups and the back. Louise attaches a certificate of authenticity to her work, which is a nice touch! The price includes free shipping worldwide. Quilt ships from Sacramento, California, USA. Flat surface design. Back finished. Hanging from rod through sleeve on back w/wire. Materials Used: 100% cotton fabrics (commercial & hand dyed), digital images from photograph for head and hands. Raw edge applique, machine stitched shadowing/background fill. Edge of work is bound with a fabric edge, sewn to the back for finish. Hanging: Hangs from rod that slides through a sleeve that has been sewn to the top back edge. The rod has hook eyes on each end for either hanging direct over nails in the wall or for threading hanging wire through to hang the piece with wire. Cleaning: Do not spray water or wash either of these fiber collage pieces. Hand vacuum or dust. All textiles should be kept out of direct sunlight. 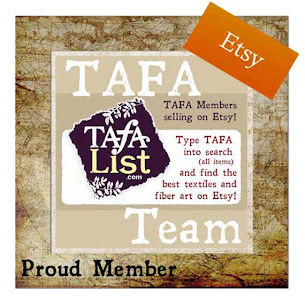 Visit Louise Schiele’s profile on TAFA!